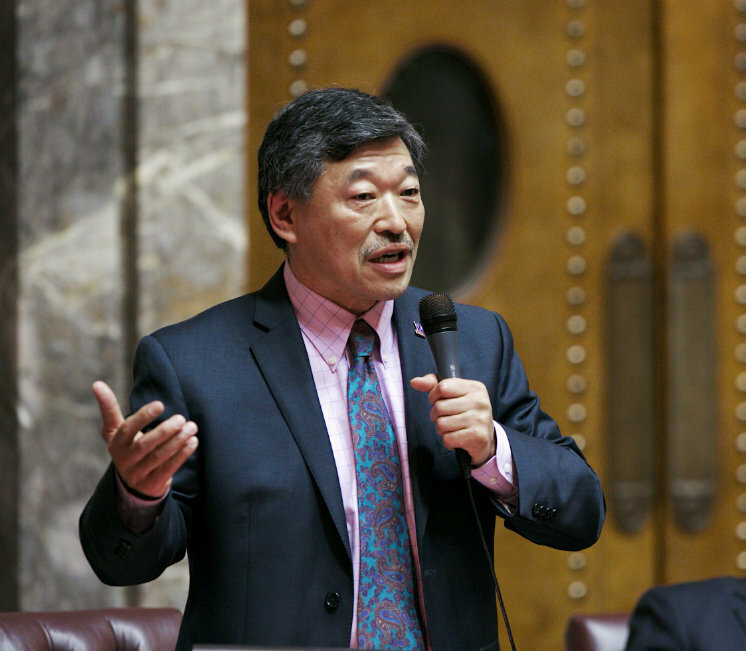 In this video update, Sen. Bob Hasegawa voices his concerns with the Senate budget passed by the Republican majority this session and its reliance on fiscal gimmicks instead of sound accounting principles. With only a couple of days left in the legislative session, it appears inevitable that we’ll be called back for a special session. When the Republicans launched their takeover of the Senate back in January, we warned them that it would create division and ensure a culture of dysfunction that would make it more difficult to reach consensus — and that’s exactly what happened. So while I’m disappointed that we were unable to complete the work we were sent here to do, I’m not surprised. We don’t know yet whether we’ll return for an immediate special session or be called back only after budget negotiators have had a chance to get nearer an agreement on the operating and capital budgets, but I’ll keep you posted. I was disturbed by the direction of the operating budget passed by the Republican-dominated Senate — it clearly penalizes working men and women and their families in order to preserve corporate tax breaks that offer dubious if any benefits to the state — and I voted against it. As the Senate and House reconcile the differences in their budgets, I will press for us to honor the priorities proposed by Gov. Inslee and the House that are more supportive of families and middle-class values. After four years of all-cuts budgets, I cannot and will not support another all-cuts budget, particularly when the cuts are made only to working families and vulnerable Washingtonians, not to needless tax loopholes for big businesses and corporations when our needs are so great to fund education and preserve programs that build and strengthen our middle class. Twice in the past two weeks, the Republican majority blocked efforts by our caucus to vote on two bills that have support from a majority of members of the Senate: the Washington Dream Act and the Reproductive Parity Act. We know we have majority support because we presented a letter to the Republican leadership with 25 signatures, enough to pass both bills. The Reproductive Parity Act, HB 1044, would uphold our state’s long tradition of allowing women — not insurance companies — to make their own health care choices and to ensure that the choices remain based on reasons of health and not economics or religious dictates. These bills are supported by a majority of senators, but the Republican leadership in the Senate blocked them repeatedly, first by refusing to give the Senate versions of the bills so much as a hearing and then by voting in lockstep against bringing the House versions to the Senate floor for a vote — even though both bills passed the House with bipartisan support. 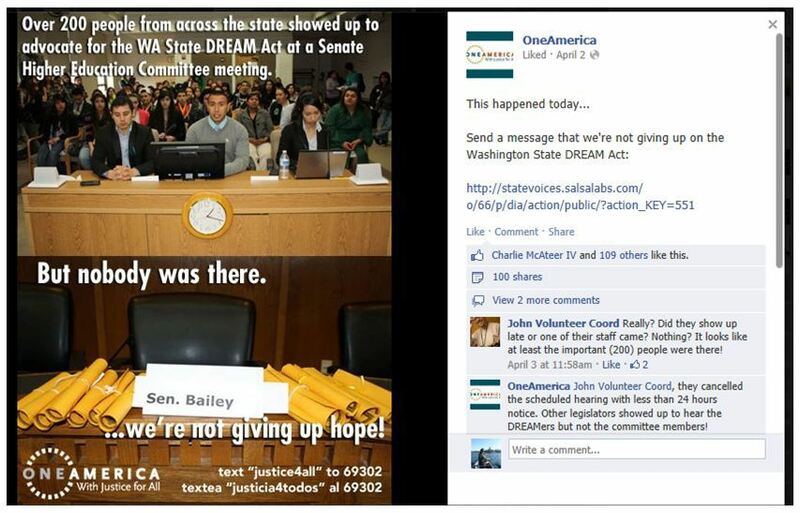 In fact, the Republican leadership cancelled the Senate Higher Education Committee hearing on the Dream Act after it became known that a number of potential students were traveling to the Capitol to testify on behalf of the bill. In other words, those most affected by the legislation would be denied the opportunity to state their case. Those determined students showed up anyway and held their own hearing, delivering their testimony all the same, even though the Republicans turned them a deaf ear. I was as impressed by the students as I was disappointed by the Republicans who canceled the hearing. In the end, the arguments for blocking these two bills from coming to the floor were stunning in their audacity. In multiple public statements, the Senate majority leader — who said he supported both bills and would vote to pass them — offered a wide and contradictory range of reasons for blocking the bills. He said he could not force the respective chairs of the committees that heard those bills to pass them out of committee. Then he said that a parliamentary maneuver called the Ninth Order, designed to pull bills to the floor directly from committee, would be inappropriate — even though he joined with Republicans to use that very maneuver last year to take over control of the Senate. At one point, he actually blamed the failure to pass the Dream Act on the very Democrats who wanted to vote for it and fought to bring it to the floor, saying it was because a Democrat declined an offer to chair the Higher Education Committee—even though the legislation ultimately was blocked in the Rules Committee and not in the Higher Education Committee. At another stage, he said his caucus would not consider the Dream Act because they wanted to focus only on bills that involved three areas —education, jobs and the budget — and voted in lockstep with the Republican majority to defeat an effort by Democrats to bring the Dream Act to the floor for a vote. Think about that last one for a moment. What is the Dream Act about if not education and jobs? The primary goal of the bill is to expand access to higher education to deserving students. And why do those students seek a better education? Because they know better education leads to better jobs! The number of jobs across our state that go unfilled today due to a lack of trained workers is projected at 25,000 and is expected to reach 50,000 by 2017. The Dream Act could help educate many of the students who want to fill those jobs. And yet the majority leader says the Senate should not pass the Dream Act even though he claims to be in favor of it and even though it speaks directly to two out of three of his caucus’ supposed priorities. On a different day, we pressed ahead and tried to amend the Reproductive Parity Act into a related health bill on the floor, only to be blocked once again by the majority leader and his caucus again voting in lockstep against our motion. The actions of the majority leader and the Republican majority blatantly contradict their insistence throughout the legislative session that the Republican majority would promote bipartisanship and collaboration. Bipartisanship doesn’t mean voting in lockstep to block bills you know have solid bipartisan support. Collaboration doesn’t mean voting in lockstep to prevent bills from across the aisle from being put to a vote of the full Senate. Instead, the Republicans have used their slim majority to pass bills in committee and off the Senate floor that erode family security by rolling back Workers Compensation benefits, creating a sub-minimum wage, reducing Family Medical Leave benefits, and slashing construction and infrastructure projects that put people to work across our state. If Republicans had truly promoted or honored collaboration and bipartisanship, none of those bills would have passed. As appalled as I am by the Republican majority’s determination to keep The Dream Act and the Reproductive Party Act from moving forward, I’m even more determined to fight to bring them to passage. If we can do it this session, great. If not, we will pick up the battle next session. The people of Washington deserve better and I will continue fighting for these important measures to expand access to education and protect women’s health.